BLOG TALK: ON READER ETIQUETTE. Are there rules for when it comes to being a blog reader? We (as in I, haha) talk all the time about being a blogger, but rarely do I think a lot about being a blog reader. But I think that just as it's important to write posts from the heart, it's also important to write comments from the heart. When it comes to blog reading, I try my hardest to write comments from the heart. While I love getting comments, the ones where people write lengthy paragraphs always mean more to me than the comments where people leave one sentence. Before I get carried away or call myself a hypocrite (because yes, I am guilty of leaving short comments every now and then!) I do think that it depends on the post's content. Some posts, like my Bits and Pieces posts, for example, are one-sentence type posts. But that's not to say I won't accept the lengthy ones there, too! I guess what I'm trying to say is that when it comes to my blog comments, I try to leave what I'd want to read as the blog author. I hope to leave comments that are original, from the heart, and worthy of the blogger's time and energy. I also try and leave comments with smiley faces or an exclamation (or two!) as well. Because when it comes to writing, you sometimes need to include a happy smiley face to get your mood and attitude across the screen, for lack of a better word. What do you consider to be polite or a must when it comes to being a blog reader? 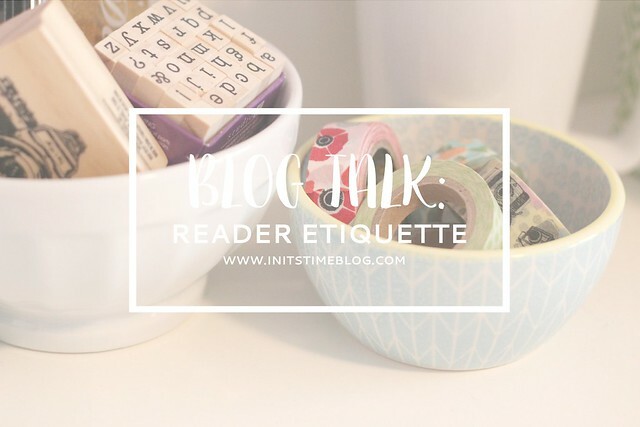 Do you have your own set of rules or manners for yourself and/or your blog readers? I will admit i'm totally guilty of the one-sentencers every now and then - but usually that is with people i read often and they understand the one sentence haha. But when i get those long paragraphs = swoooonnnn it's like "i wrote something of value" hahaha. For the record, so do you! It's completely obvious when someone hasn't taken the time to actually read the post and is just leaving a one-liner comment about something that was in the headline or one of the pictures. Sometimes I do leave short comments, but in general I try to comment about something in the actual post and really leave a thoughtful comment. That's what makes blogging fun! Getting a bunch of "so cool!" comments doesn't really lead to genuine interaction, and I feel a little insulted the person didn't take time to actually read my post. I know we are all short on time, but I think maybe we should be reading *fewer* blogs more slowly than more blogs we just skim through. I'm like you... I only comment if its something I really want to say. And if that means I don't comment... that doesn't mean I didn't like a post or whatever... I just tend to not have a ton to say in general anyways! Can I just affirm that you definitely (write) as you preach?! :) You have always, always, always left the most thoughtful, genuine, and kind comments and I've always admired you for that. Even the way you respond to others' comments always goes beyond just a thank you but you continue the convo! How you know exactly what to say is beyond me but... You are a gem. I think sometimes I lean away from longer paragraphs (especially when bloggers have larger followings) because I doubt they'll even read what I have to say! Do you ever feel that way? Also, I often stray away from commenting at all for larger blogs because I, too, feel like they likely won't read them. Which, is really weird because it's often not true, but still. Glad to know I'm not the only one who feels this way! I definitely do the scroll back and forth thing for posts that I read! I find myself doing that especially for the posts in the Circle and for other link-ups, too because I tend to visit a lot of blogs in a shorter period of time than normal. Same goes for you, Amanda! Girl, I think we ALLLL are. I do that here and there because there are times and posts where there just isn't much more to say and I just want the blogger to know that I read/appreciated their post. I, too, have times where I won't leave a response at all--but that doesn't mean I don't read the posts! And for the record, your swoooonnnn responses are some of my faves. It's such an original yet perfect response for posts! I know EXACTLY what you're saying. There are times when I get (or read comments on other blogs) where people are simply saying "I love this!" and then add in a "Come follow me!" at the end. And I have a feeling a lot of times, they really just want to announce their presence. That sounds wayyyy ruder than I wanted it to, but I think that bloggers deserve comments that are real, even if they are short responses! I LOVE what you said about maybe cutting down on blogs that you read. I think that it's an important thing to really think about when it comes to blog reading. I tend to go through the blogs that I visit on a more daily basis every couple months and try to cut it down so that I can just have it be more manageable. But it's hard to really put quality over quantity into practice! And I agree, it IS amazing how someone's blog posts can inspire future blog posts. I've found that to be true when I write posts myself! Good point about getting exhausted over trying to comment on EVERYTHING. As much as I want to, I just can't do everything! I've actually had to cut down on how often I read blogs because I've found that when I try to read blogs every day (while working, especially), I just don't get a chance to really read them. So I'll often skim and then I click onto the next blog. I totally agree with this! Paragraph comments always warm my heart :-) Even if a comment isn't long, I love when it's thoughtful; any comment that reflects a reader having read the whole post is a win as far as I'm concerned. I think my reader etiquette is basically "don't comment if you didn't actually read it." Not all of my posts are very serious, but when I do write seriously, there's nothing worse than getting an "I like the picture" type comment that completely ignores the content! I love these thoughts! I am guilty of short "so cute" comments but I try to be heartfelt, I know as a blogger I love an appreciate receiving these comments and I love to go check out bloggers that leave comments like this. I agree, the length doesn't matter to me as much as the content does. I just think that paragraph comments (like yours!) tend to lend themselves to being more thoughtful because they take longer to create. I think we all are! At least I am, too! :) I wrote this in another comment, but I think I prefer the longer comments because they tend to lend themselves to being more thoughtful and heartfelt--and I think it's simply because they just take a second or two more to write! I totally agree with you - although I am totally guilty of many short comments. Not because I don't want to talk to someone, but many times I start to overthink what I am typing and shy away from anything that could be considered too forward and/or rambling. I think this might cause me to miss out on making some really lovely friends though, so I'm going to try and be more thoughtful with my comments from now on, and say the things I really want to say! And what I want to say about this post is: I LOVE all these unique topics you come up with! You are like a content machine, and the best part is that it is all so genuine! I completely agree with everything you wrote here. I sometimes refrain from writing a comment that is too long because I guess I think it can come off as too eager...but then again I love when people write from their heart in the comments of my blog. So I totally see where you're coming from when you say that you try to leave what you'd want to read. Aw, Aida you are soooo sweet. :) I completely agree with your thoughts, too! I think that I tend to stray away from long comments sometimes just because I wonder if I'll ramble or anything. But like you said, since I LOVE long comments, long comments it is--even if I DO ramble, haha. Thank you so much for reading AND commenting! I have loved getting to know you and look forward to getting to know you better! I like this post and I like the perspective you took from the readers view point. I honestly love love love long lengthy comments. I think that a lot of my friendships that have developed through blogging are in part because of the lengthy comments that turn into e-mails and then friendships. PS - Sarah I will tell you that your comments are one of my favorites on my blog! You are always thoughtful and considerate when commenting and I love it! I have occasionally left short novels as comments, so I totally know what you mean! And another huge yes to short novels for comments. Those are the best! And I've also struggled with those one-liner comments. I will usually say something like "thanks!" but other than that, it's hard for me to come up with a long-ish comment in return!